leading specialists in the UK. Hair replacement systems for both men and women. Wish you didn’t have hair loss or pattern baldness? Looking at the methods, tricks, techniques that cure hair loss? The reality is that there is no special cure that will make your hair all grow back but hair replacement West Midlands provides a ‘solution’ that will give you a full head of natural hair, any hair style that you wish. You need to watch our hair replacement systems fitting and styling video below which will give a better understanding of the process involved. We have been in the city centre of Wolverhampton for many years (over 25 years) and therefore have the experience which is needed to provide the solution to suit our client – everyone has different needs and we are able to adapt to suit the individual. Hair Replacement West Midlands is the answer to your hair loss and it is worth coming to visit us. Hair replacement systems are used all over the world as the treatment for hair loss, no surgery, no tablets and a look and finish that you want. There are simple steps to having a full head of hair and the following is a brief introduction and the basics involved. You book your appointment at a time and day to suit you. In a private cubicle we discuss your hair loss and suggest the best type of system, hair style and come up with a custom solution. 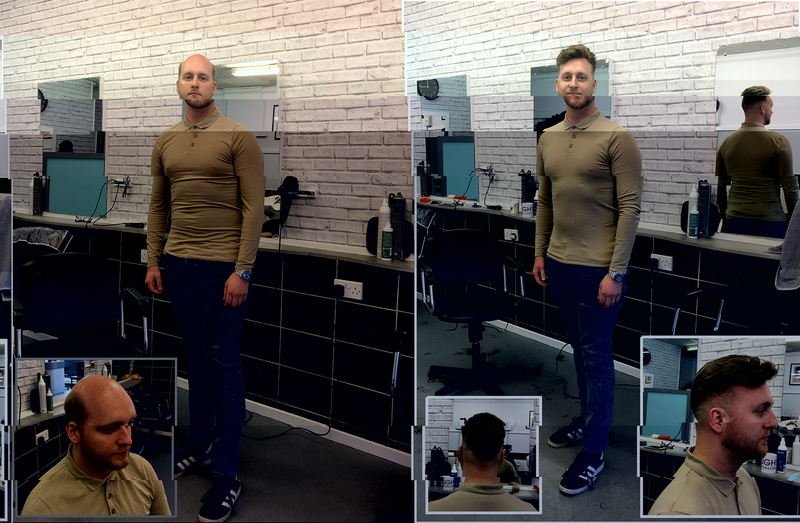 We then take measurements and order your system – (we also have systems in stock that may be suitable) – we then fit the system to fit the area of baldness exactly. We then integrate and blend your system with any hair of your own (if you have pattern baldness) so that it looks natural and no-one can notice that you have a system in place. We then style your hair to the design that you want and you leave the salon with a full head of hair and no more hair loss worries! Click here for directions to us! – we are approx 52 min drive. How long do the hair system last? Our systems last 12+ months. We provide a maintenance sheet and talk you through how to look after your hair. What happens when my existing hair grows? If you have pattern baldness r existing hair will grow and need cutting like normal. It will need blending and integrating with your existing hair, every 4-6 weeks. Clients usually visit us for this ‘maintenance’. Do I need to remove the system every night? No you can leave your hair in place for weeks – it depends on your lifestyle and varies client to client, but you can remove and re-attach every day or leave in place for 4+ weeks. How is the system fixed to my head? Either using a tape or glue – it depends on your lifestyle, if you swim regulary then a waterproof glue is the answer, if you plan to remove often then a tape is best for you. All is very secure and will not come loose at all. How long does it take to have the system fitted? You could leave the salon with a full head of hair in less than 2 hours – what we need is an initial visit where we chat and take some measurements and then you come back for a fit within the week, which takes about 1-2 hours. We are in Wolverhampton – have parking available are are also only a short walk from the main train station and bus depot. We have clients who travel from all over the UK.